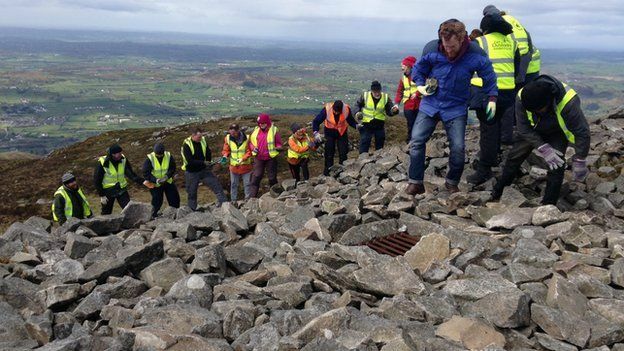 Slieve Gullion: Volunteers help repair ancient cairn. A group of volunteers has helped to repair a 5,000-year-old burial cairn on one of Northern Ireland’s most significant mountains. Around 30 of them trekked to the top of Slieve Gullion in south Armagh at the weekend to carry out the work, under the supervision of an archaeologist. They helped to fix damage done to the huge passage grave by the weather and increasing numbers of hill walkers. Stones had become dislodged from the top of the ancient cairn. As a result, the entrance to the site was in danger of being blocked. The burial chamber is lined up to illuminate with the light from the setting sun of the winter solstice on 21 December every year.